9 Belizeans amongst HSBC clients that stashed billions in Swiss Accounts. 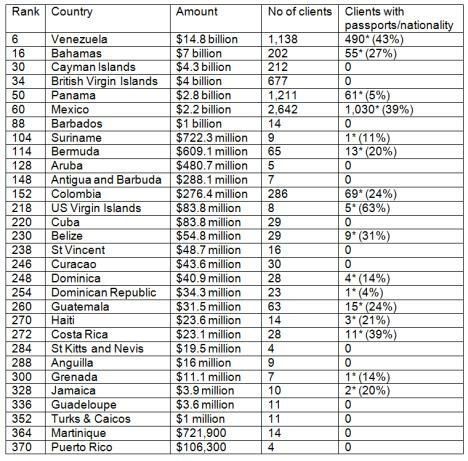 The Belize clients held about 54.8 million US or over 109 million Belize dollars in hidden accounts. WASHINGTON, USA -- The International Consortium of Investigative Journalists released a report this week revealing billions of dollars held in nearly 60,000 internal Swiss bank documents from 2006 to 2007 leaked by whistleblower Hervé Falciani, a former employee of HSBC in Switzerland. Some of these come as no surprise in that territories such as the Cayman Islands and the British Virgin Islands are established offshore financial centres and none of the leaked accounts were held by their citizens or passport holders although billions of dollars were held in accounts associated with those territories. However, in the case of The Bahamas, although it is also a financial centre, 55 Bahamian citizens or passport holders were associated with accounts at HSBC. Likewise, Bermuda, where 13 of its citizens or passport holders were associated with such accounts. Also noteworthy is that one Suriname national held an account with HSBC in Switzerland, five customers from the US Virgin Islands, nine from Belize, four from Dominica, one from the Dominican Republic, three from Haiti, one from Grenada and two from Jamaica. Venezuelans are also questioning why a former treasury minister and ex-bodyguard of late President Hugo Chávez is linked to an account with HSBC holding billions of dollars -- one of 490 customers holding Venezuelan passports. Venezuelan opposition deputy Andrés Velasquez spoke out in response to the leaks on Monday. “I request that the government clarify the destinations of the public fund deposits in Swiss accounts,” he wrote on Twitter. “The corruption of the regime has obliterated immense oil revenue,” he added.